Woodhead’s specialist sustainability team Woodhead Living have been working alongside social enterprise BESTbuild to build four brand new sustainable bungalows on Denton Green in Broxtowe. The latest project to complete in the city’s Building a Better Nottingham programme, all four new tenants have now moved in and are looking forward to living in their new homes. The new bungalows on Denton Green form part of Nottingham City Council (NCC) and Nottingham City Homes’ (NCH) Building a Better Nottingham scheme which is seeing over 400 new homes being built across the city. Thirty five homes have already been built, with over 140 further properties due for completion this year. It’s not just about building new homes, it’s about transforming communities and creating homes and places where people want to live. The site on the corner of Denton Green was created when two former council homes (more recently being used as a community resource, which has since been relocated) were demolished to pave the way for the bungalows, which are meeting a local housing need. One of the key drivers of the project was using local tradespeople, early calculations indicate that for every £1 spend on the project, £2.88 was invested back into the Nottinghamshire economy. 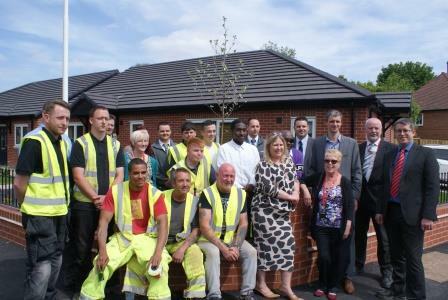 Working alongside Woodhead Living have been managers, apprentices and tradespeople from nearby social enterprise scheme, BESTbuild, part of the BEST Group of Social Enterprises. Site managers and experienced tradespeople from Woodhead Living have been on hand to guide the trainees, providing them with valuable site experience, as well as sharing their skills and knowledge. The four bungalows provide much-needed energy efficient homes for older or vulnerable people, who need single storey living. While building the new homes, Denton Green was placed in the top 1% of sites across the country by the Considerate Constructors Scheme (CCS). Glenn Slater, Director of Business Development at Woodhead, said: “On all our sites we aim to involve the community as much as we can, often working alongside schools and community groups, as well as inviting budding construction apprentices to find out more about careers in the industry. The inspector said: “The image projected by the site is excellent and an important public demonstration of appearance. This is acknowledged as a socially deprived area with high unemployment and it is good to see the efforts made to engage with local people. Councillor Alex Ball, Executive Assistant for housing and regeneration has been watching the scheme as it’s progressed. He added: “The Building a Better Nottingham scheme is making a huge difference to the city as a whole. It’s been fantastic to see this work happening in my own ward and learning more about the community benefits of the scheme. The young people here have learned a great deal from the team at Woodhead Living and NCH, and I would like to thank them for their efforts in supporting the apprentices while ploughing ahead as efficiently as possible, delivering homes of a very good standard. Anna Mimms MBE has been Chief Executive at BEST for 11 years and founded BESTbuild in response to the economic down turn. The social enterprise works with the people in the Broxtowe community, serving the local area to get residents back into employment while building skills and qualifications. BESTbuild is an award winning social enterprise construction company that employs as many local unemployed people as possible, as well as providing further training and education opportunities to those looking to get into the construction industry.